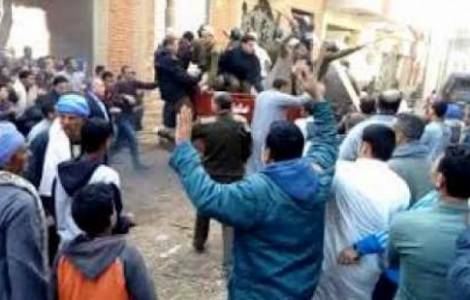 Minya (Agenzia Fides) - Some Coptic jurists have denounced the governor of Minya province before the attorney general about the facts that in recent days have led to the closure of a Coptic place of worship in the village of Mansheyat Zaafarana. The Coptic jurists – reports the Copts United website - have attached also video-photographic material to their complaint attesting how the police did not defend the place of worship from the attack of groups of Islamist mobs who asked for the closure. In Mansheyat Zaafarana there is a private building adapted to a place where members of the local Coptic community pray (about a thousand faithful). The riots started on January 7th, when several hundred hotheads surrounded the place of worship shouting offensive and intimidating slogans in the presence of security forces. The police asked the demonstrators to calm down, promising them that the Christian place of worship would be closed. Even the Coptic Orthodox diocese of Minya stigmatized the attitude of local authorities to give in to pressure from intransigents, who always manage to impose their illegitimate claims against the Copts by force. In the last month, in the province of Minya, three churches were closed after protests and sectarian incidents. Those of MansheyatZaafarana took place a few hours after the Christmas vigil, which also saw Egyptian President Abdel Fattah al Sisi intervene in the liturgy celebrated by Coptic Patriarch Tawadros II in the new Cathedral dedicated to the Nativity of Christ, built in the new Egyptian administrative capital and presented with emphasis by the Egyptian authorities as the largest church in the Middle East. In recent years, a process of restoration and regularization of Christian places of worship is underway in Egypt, which has already allowed to reopen or "legalize" 500 churches and chapels throughout the Country. As already reported by Fides (see Fides 4/5/2018), there are more than 3 thousand Christian places of worship that will have to be examined by the government apparatus to verify whether they meet the standards established by the new law. In recent decades, many of the Christian places of worship to be subjected to the assessment of governmental control bodies were built spontaneously, without all the necessary authorizations. In the past, precisely such buildings raised by local Christian communities had been used as a pretext by Islamist groups to foment sectarian violence against Christians. The law on places of worship, approved at the end of August 2016 (see Fides 31/8/2016) represented for the Egyptian Christian communities a step forward compared to the so-called "10 Rules" added in 1934 to the Ottoman legislation from the Ministry of Interior, which prohibited, among other things to build new churches near schools, channels, government buildings, railways and residential areas. In many cases, the strict application of those rules has prevented to build churches in cities and villages inhabited by Christians, especially in rural areas of Upper Egypt.